Charge up for winter! New to the Snow Joe lineup is the Snow Joe iON13SS 40 V 13-inch cordless snow shovel. Ideal for quick, easy and CORD-FREE snow pickups on decks, steps, patios and sidewalks, the iON13SS combines innovation and functionality to deliver the ultimate grab-n-go snow-busting tool. EcoSharp Battery Technology. Powered by EcoSharp technology, Snow Joes patented rechargeable 40-volt 4.0 Ah lithium-ion battery system, the iON13SS delivers up to 52 minutes of whisper-quiet runtime with zero carbon emissions for cleaner air. No pull-cords, gas, oil, tune-ups or tangled extension cords to cause unnecessary frustration! Innovative Brushless System. The iON13SS features an innovative 500 W brushless motor that increases the batterys efficiency and delivers the power to blast through 300 pounds of snow per minute. The brushless system also produces less noise and vibration and extends the life of the motor for maximum durability and reliable performance. User-Friendly Features. The Snow Joe iON13SS starts instantly with the simple push of a button and its patented back-saving handle maximizes operator comfort during use. Its lightweight and compact design makes it easy to tote onto your deck or steps to clear out fast. It also stores neatly inside a hall closet for convenient on-the-go access. Equipped with a heavy-duty, 2-blade paddle auger, the iON13SS throws snow up to 25 feet, clearing a path 13-inches wide by 6-inches deep with each pass. Its durable scraper bar at the base of the unit lets you clear right to the ground without damaging your deck or pavement. GET EQUIPPED this winter with the Snow Joe iON13SS the easy, convenient and cordless solution to get snow out of your way on your snow day. ETL approved; Full 2-year warranty; Energy Star certified. 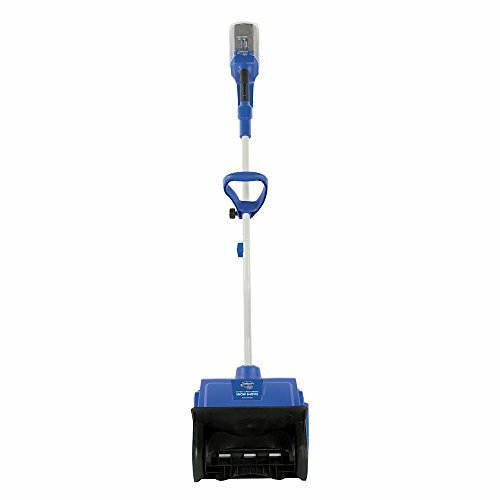 Snow Joe 13SS 13-Inch Wide Hybrid Electric Snow Shovel (Certified Refurbished) -- Free 1-3 Day Delivery With Hassle-free, 30-day Returns! Last updated: April 20, 2019 at 11:21 EST. Pricing information is provided by the listed merchants. GoSale.com is not responsible for the accuracy of pricing information, product information or the images provided. Product prices and availability is subject to change. Any price and availability information displayed on amazon.com or other merchants at the time of purchase will apply to the purchase of the product. As always, be sure to visit the merchant's site to review and verify product information, price, and shipping costs. GoSale.com is not responsible for the content and opinions contained in customer submitted reviews.